In June I visited a country which has since a long time fascinated me: Poland. Friendly people. Forests. The Baltic. Great food. 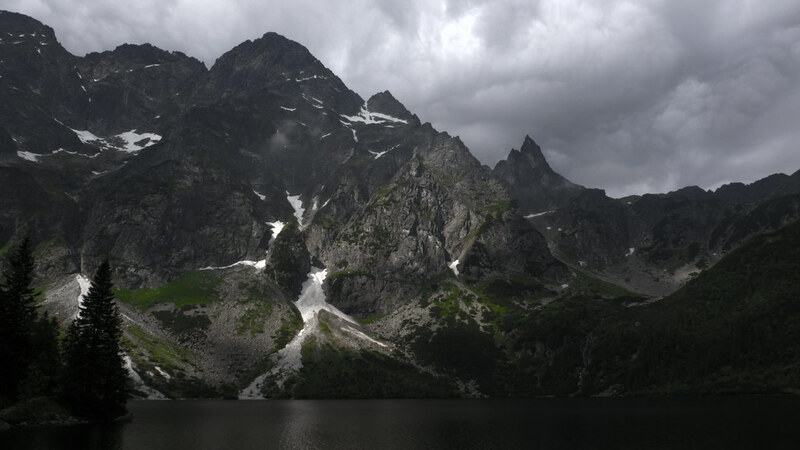 And the Tatra Mountain Range. Plenty of reasons to pay a visit to this lovely country, but it was the latter one which brought me here, and which I set off to explore for a week of climbing, mountaineering and hiking. 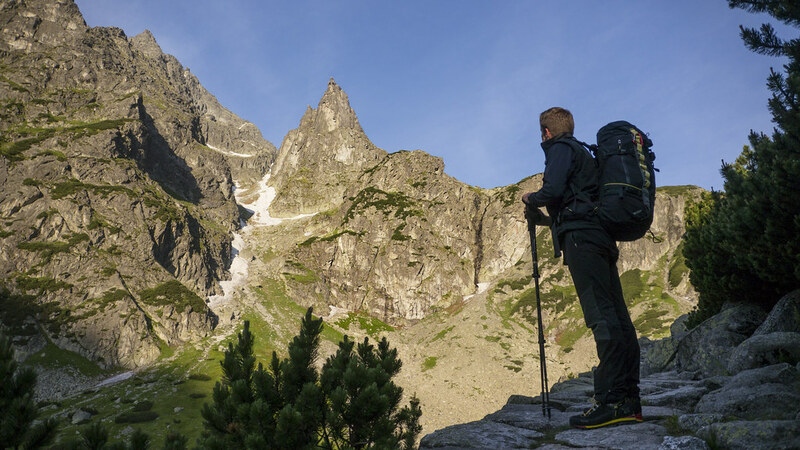 I arrived after a short flight in Krakow, got my backpack and then started the ride to Zakopane. It was almost 23 o’clock as I arrived at the Hotel Skalny and then just took a quick shower before I fell tired into my bed. After a delicious breakfast and the best scrambled eggs I have ever eaten I pack my hiking gear, deposit some stuff at the reception and then walk to the centre. Zakopane has a nice pedestrian shopping street and it felt like every third store was a outdoor shop, so if I’d had forgotten something there’d been plenty of chances to stock up on gear. I only needed a map which I found from one of the various stalls along the street. Then I took out some Polish Zloty from an ATM, bought a few more snacks and walked to the bus station - Zakopane is small city and I found I could walk everywhere. 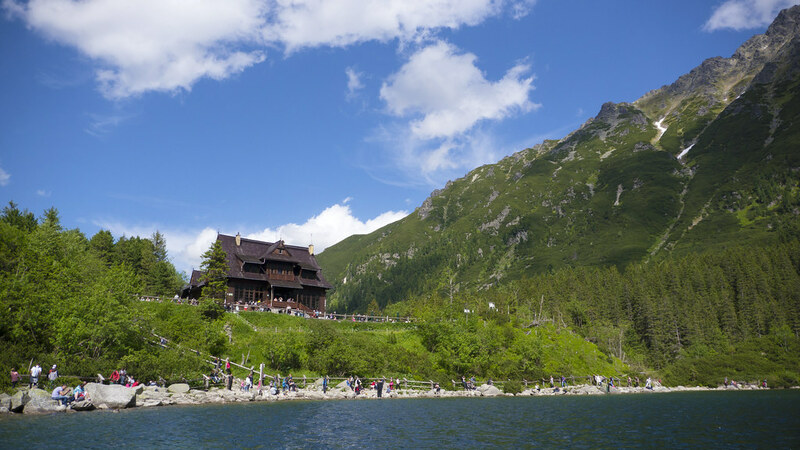 The bus to Polana Palencia/ Morskie Oko was quickly found and at noon the bus left punctually. We drove through the centre of Zakopane, suburbs and then slowly in a wide curve to where I would start my walk in the Polish Tatras. Along the way always in view on my right: The Tatras. 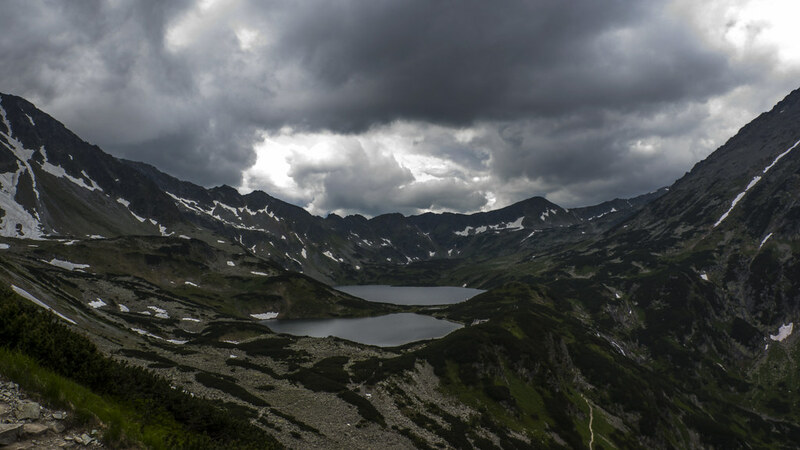 A compact mountain range these mountains are a natural border between Poland and Slovakia, and for many of their citizens a prime destination to visit. 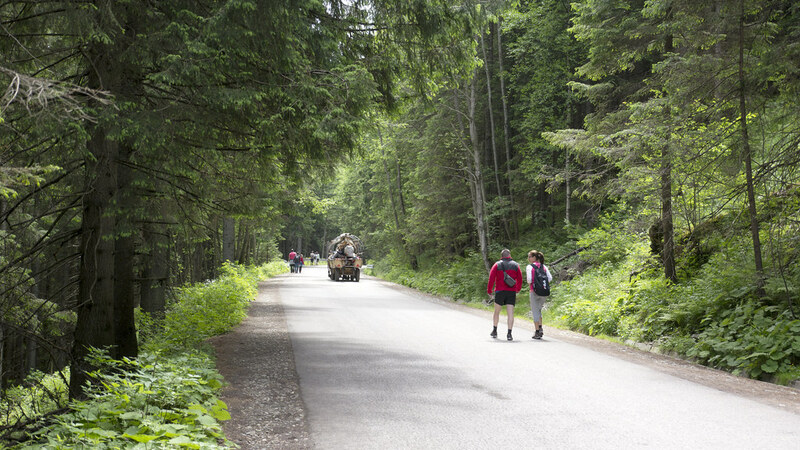 The infrastructure in place is very good, with plenty of huts and signs along the often very well maintained trails. 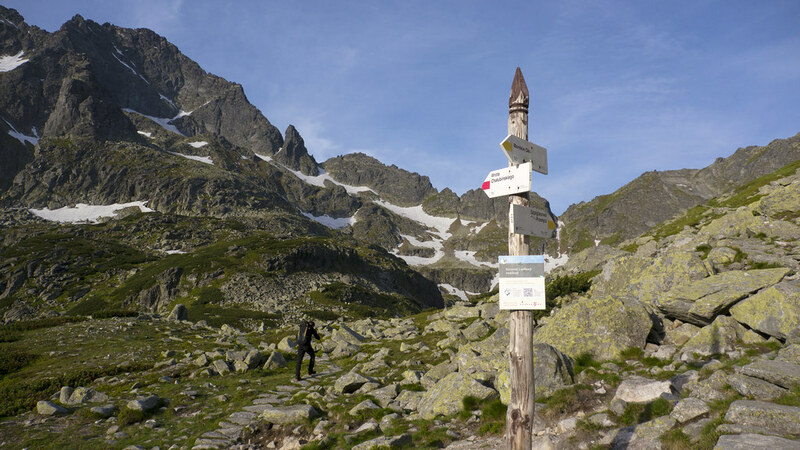 As I arrive at the parking lot at Polana Palencia I pay the 25 Zloty for my 7 Day ticket to the National Park and then started the 9 km walk to the Morskie Oko Refuge. Around half way I switched from my Scarpa Rebel Ultra GTX boots into my Luna Sandals, and am very happy I took them along on this trip. 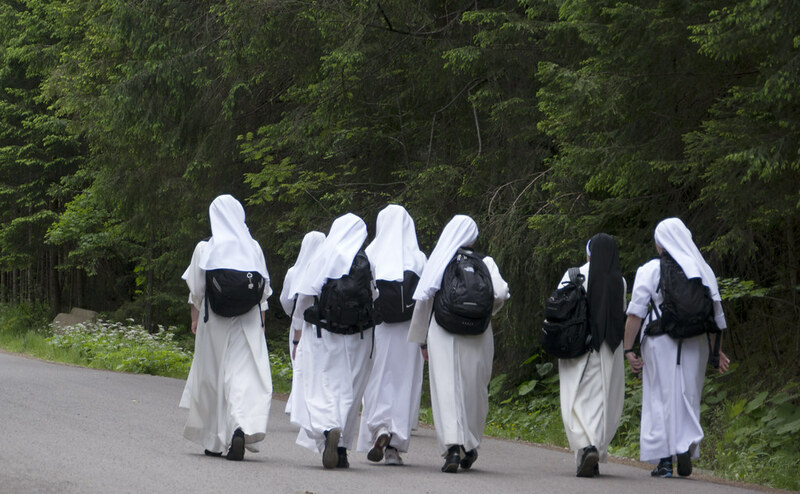 Nuns in white dresses pass me, a sight one not often sees on other trails. There are plenty of people on the road and regularly horse-drawn carriages go up and down. 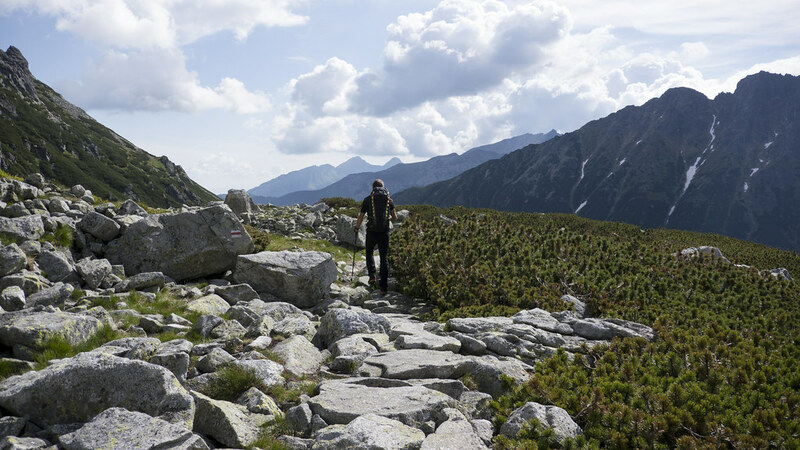 For a small fee these take you up & down and shave some 6 km off the approach to the Morskie Oko Refuge. 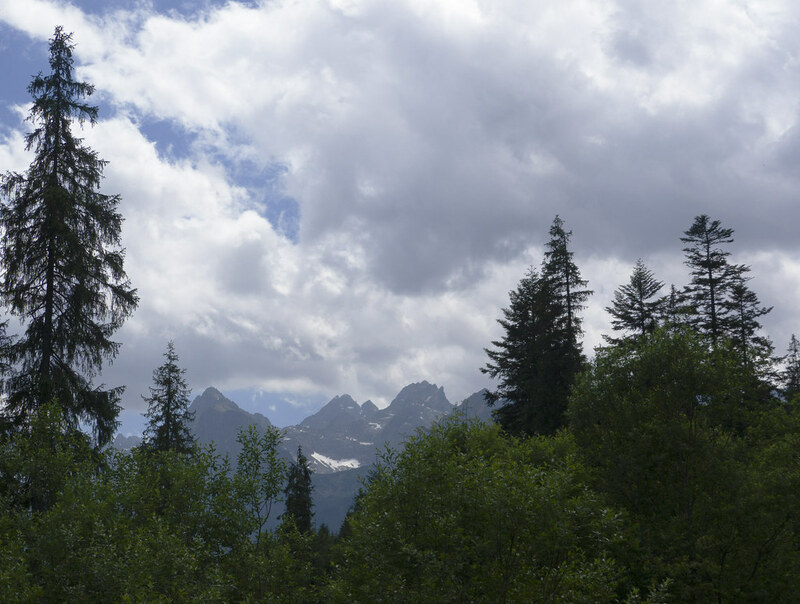 Between the spruces, far away, distant peaks come into view. I come to a large oval where the horse carriages disembark their cargo and their passengers head for refreshments at the near restaurant. People with ice creams and cool drinks pass me, some looking happy, some exhausted, and I can understand why: It’s hot and humid. The last few hundred meters to the refuge I only have my eyes on the grand scenery which unfolds in front of me and I see the peaks I will be climbing the next couple of days, and many more which would make any alpinist, climber and mountaineer happy. As I round a corner my day dreams of summits are interrupted: Dozens of people mingle in front of the beautiful old wooden building, taking in the mountains and the clear lake which lays at the bottom of them. 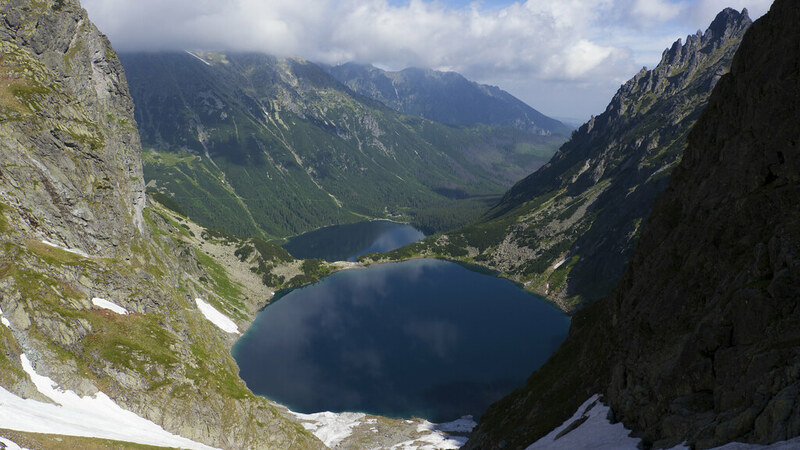 Morskie Oko. I check in, drop my pack in my room and then head out for a stroll around the lake. Finally I am walking on beautiful, narrow paths along the shore. Waterfalls come rushing down to the lake. People sit at the water, take in the view. I am one of them. Bliss. Back at the refuge I spend small money on delicious local food: Soups, sausages, pancakes, a beer. I sit on the terrace, waiting for Marcin, the Mountain Guide with whom I will be spending the next few days climbing & mountaineering in this cradle of Polish Alpinism. He arrives as the sun is setting in the west and quickly identifies me, even if we have never seen before =) We eat dinner together, quickly understanding each other well and making plans for the following days. It’s Tuesday, 6 o’clock in the morning. Our Alarms ring, we get up and take a look out of the window. The weather looks mixed, Marcin says - lets sleep another hour and then see how it looks. At 7 the weather looks similar in my opinion, but we start to pack either way. We have a light breakfast as the kitchen is still closed, so I pack a couple of extra bars and then we’re off. To Rysy. 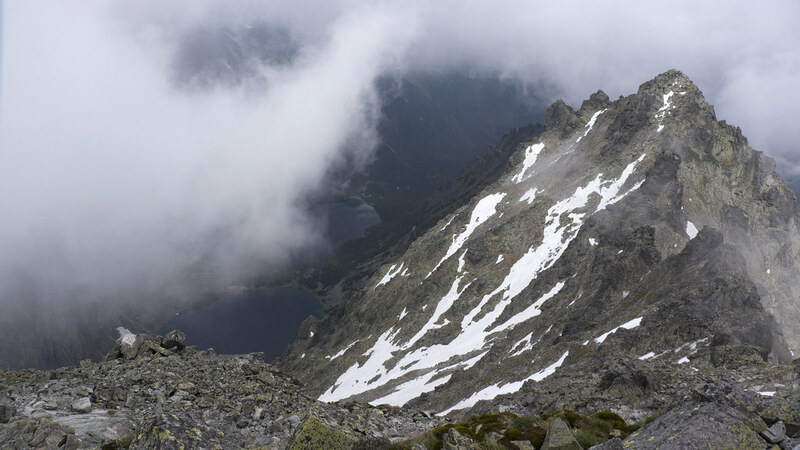 Poland’s highest summit. We hike around the lake, ascent to the 2nd lake above it and see that we are not the only ones. A couple of German girls are before us. A few lone hikers further ahead. 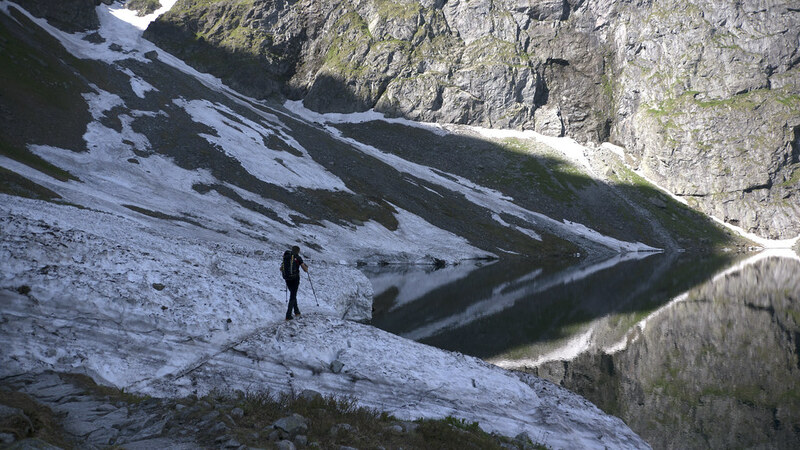 We walk around the higher lake and cross the first snow fields. A wrong step and you’d slide into the ice cold lake, and there’s evidence of some of these wrong steps in the snow. Around us steep walls and high peaks. 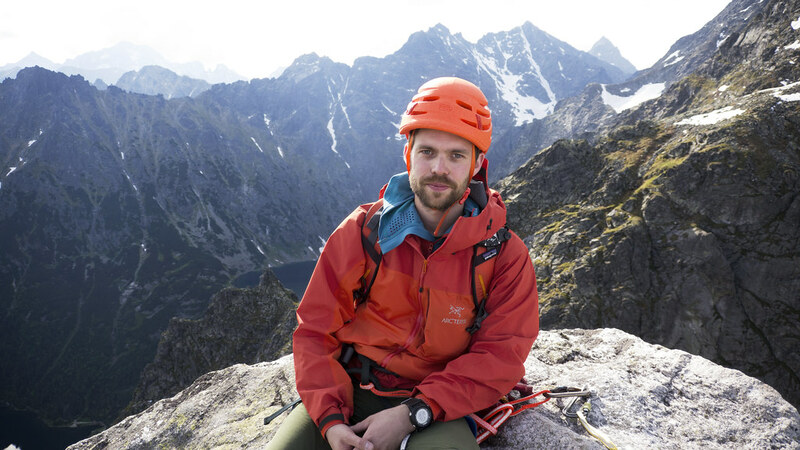 Marcin tells me about alpine and ice climbing routes and adventures, but right now my mind is set on our summer mountaineering route ahead of us. Soon the path gets steeper. 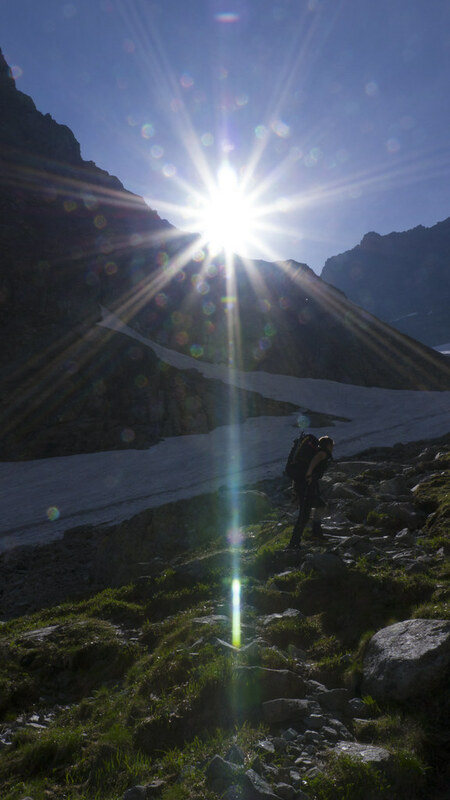 We traverse a few more snow fields, kicking steps, still crampons aren’t needed. 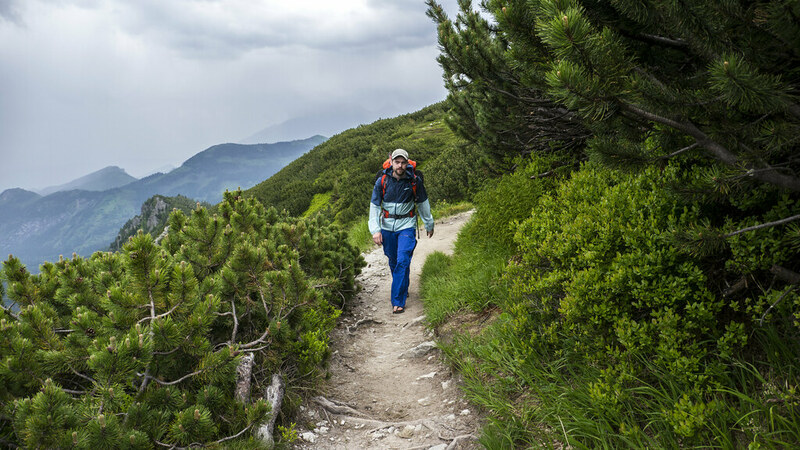 Marcin leads the way, he has hiked this trail so often that he can not even remember the amount of times that he has summited Rysy. He is also working for the local Mountain Rescue group, and gets at times a bit agitated when we pass solo hikers. As he chats shortly with them I can not make out anything of their conversation and when I enquire what they talked about it’s often the same answer: The person is the first time ever in their life in the mountains. Has no crampons nor ice axe along. No experience of how to traverse steep snow fields. But they want to stand on the summit. Some turn around and listen to his advice, to wait a few more weeks till the snow is gone. Some ignore it and push on. At least until the large snow field which then is in front of us and needs to be traversed to get to the summit. Which is where I put on my Grivel Air Tech Light crampons and take my Grivel Air Tech Racing ice axe. I put my Sirocco helmet on, we rope up and then front point the snow field up. We ignore the path others have made and take a direct route till the rocks. It takes us not long, maybe 15 to 20 minutes, and we are where the chains start. 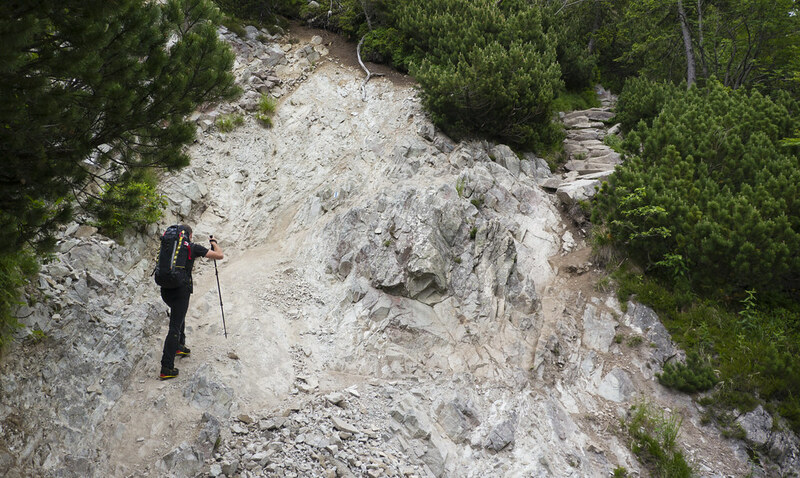 But without crampons and an ice axe you do one wrong step and then slide down the 50° slope for a long time. Snow and ice are along the route up, it’s some serious scrambling at times, and exposed. After a while in the clouds I can make out other shapes in front of us. And then we’re at the summit. Clouds hang around us, it’s windy. 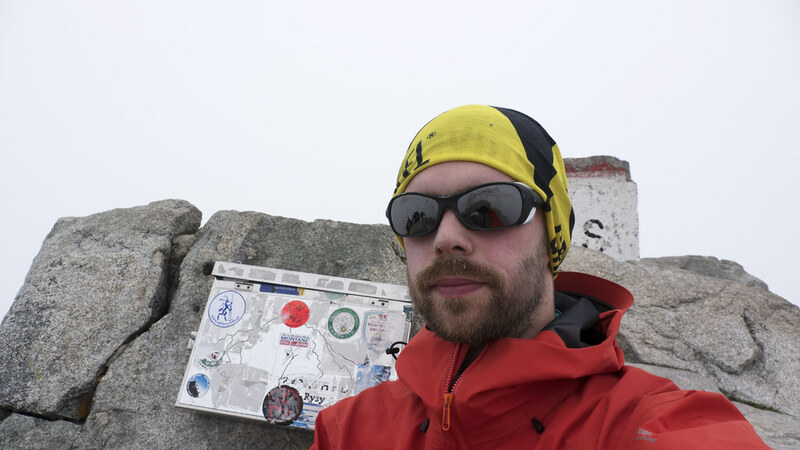 I put my PHD Ultra Down Jacket on to stay warm, scramble to the summit marker and take a Selfie. Have a snack. Wait for the clouds to part. They cooperate only a bit, but what they reveal is beautiful. 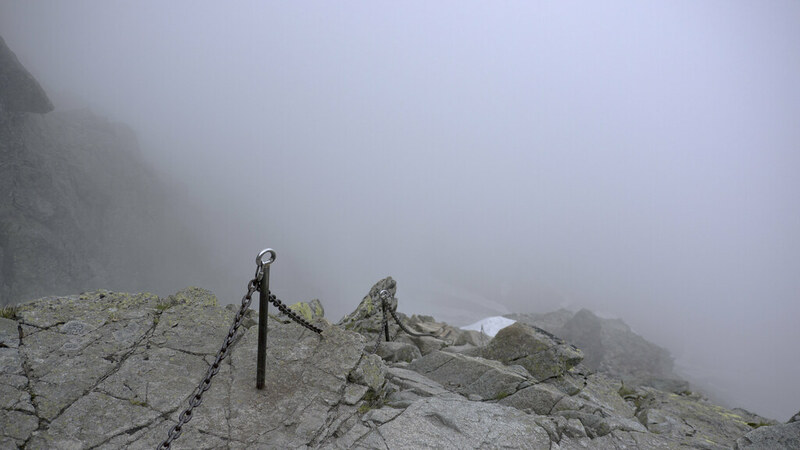 Views into Slovakia and the easy path up to Rysy. Deep valleys. Steep walls. Many possibilities. After a while we pack up again and start the descent. It goes fast, we make good speed and are at 15 o’clock back at the refuge. 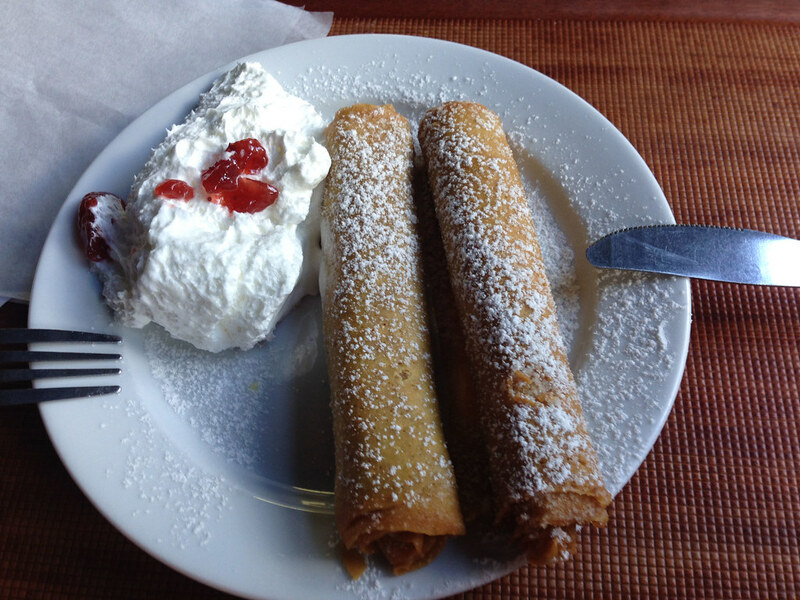 And I reward myself with them delicious pancakes! It’s 4 am as our alarms ring in unison the next morning. We eat the breakfast we bought the evening before and then silently leave the hut. The lake lies silently on our left as we ascent the beautiful path which runs up on the right of the lake. We cross clear streams, the water running noisily down to the lake. And always in front of us: Mnich. The beautiful spire we’re about to climb. We left most of our gear at the refuge, and I’m only carrying my DMM Nuts, DMM Dragons and DMM Demons, some quick draws and screw lock carabiners, harness and climbing shoes. After a mere 45 minutes we stand at the crossroad, and Marcin is a bit surprised about the speed we were able to come up here. We walk another 20 minutes and then are at the start. 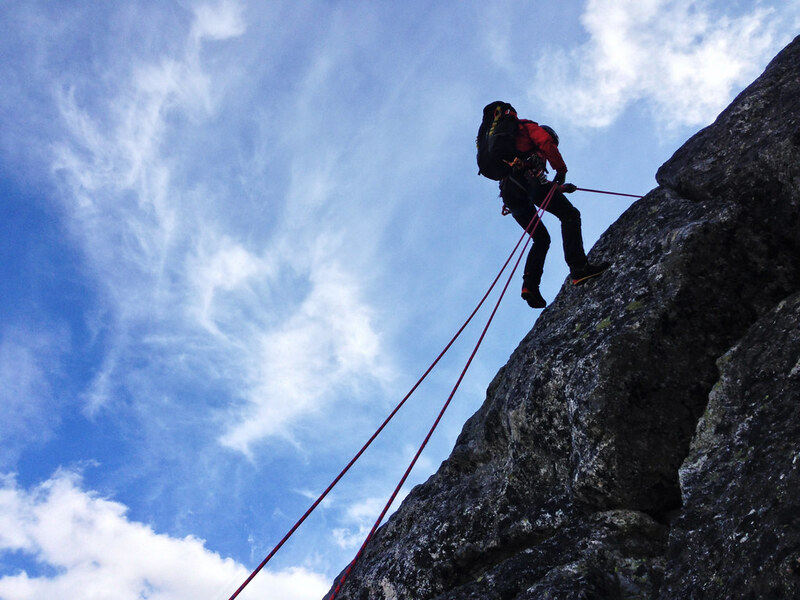 We put on harnesses, I rack up and slip into my climbing shoes. We walk a bit further till the beginning of the route and then I tie in. Marcin gives me some general advice in which direction the route goes, and off I go. Placing gear wherever I can, but it ain’t much. I’m using an old, massive bolt and wonder how many climbers have used it before me. Then I reach a good ledge and build a belay to bringing Marcin up. Another pitch and we are on the top of Mnich. On the way lots of scratches tell the story of alpinists climbing this route in winter with crampons. But right now the sun bathes us in its golden light and warms us up while a light breeze goes through the air. We’re sitting on the dining table big top of this 2.068 m high spire, happy about the fast ascent and the good weather. But from the south-east already some clouds are coming over the ridge line we see. I snap a few more photos, then thread the ropes through my Reverso 4 and start the rappel. I go first again, clip in at the large bolt, let Marcin know that he can come down. Twenty minutes later we are down where we racked up earlier. 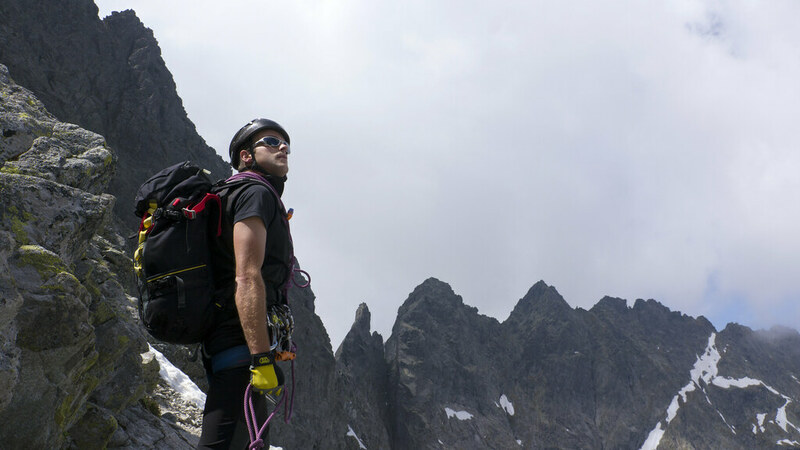 I slip out of the climbing shoes, put the OSOs back on, pack and then we’re off. 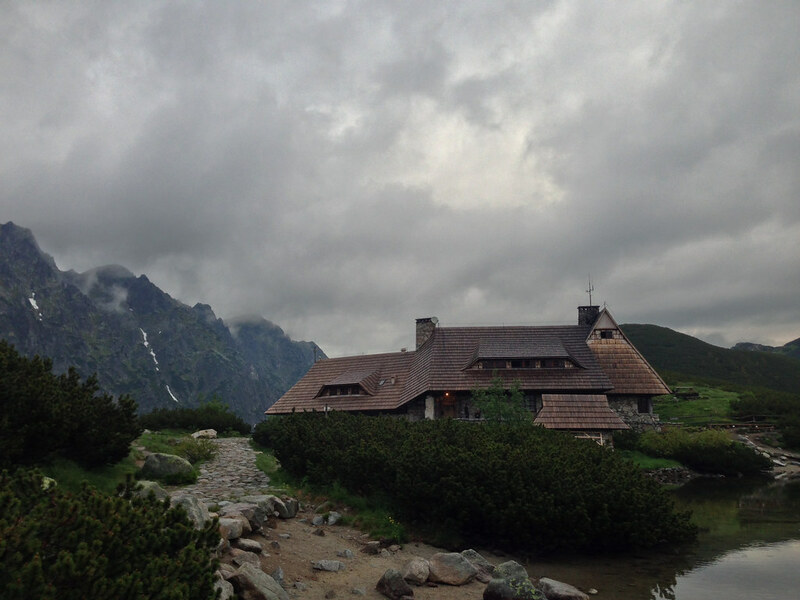 Back to Morskie Oko. We arrive well in time before Check-out and I’m having a coffee and pancakes. Then it’s packing up and leaving for the Przedni Staw Polski Refuge in the neighbouring valley. 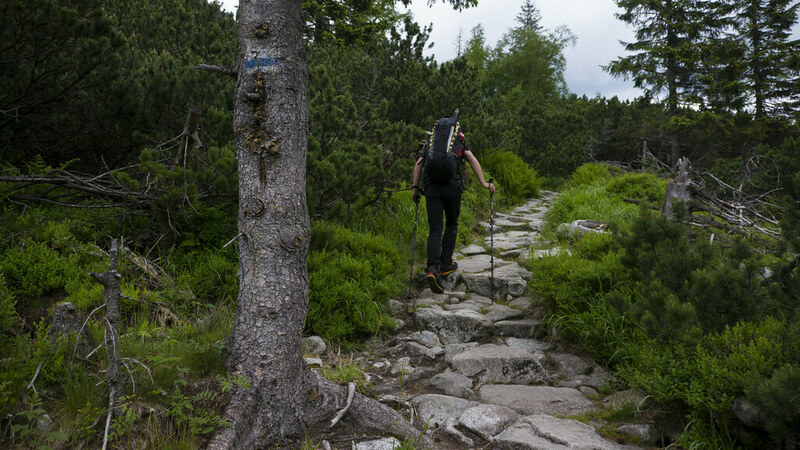 The path goes from easy to steep in no time, and I start to wonder what classifies as easy for Marcin. But then he has walked these paths for years. As we start to overtake other hikers I get a sense of what he might mean. 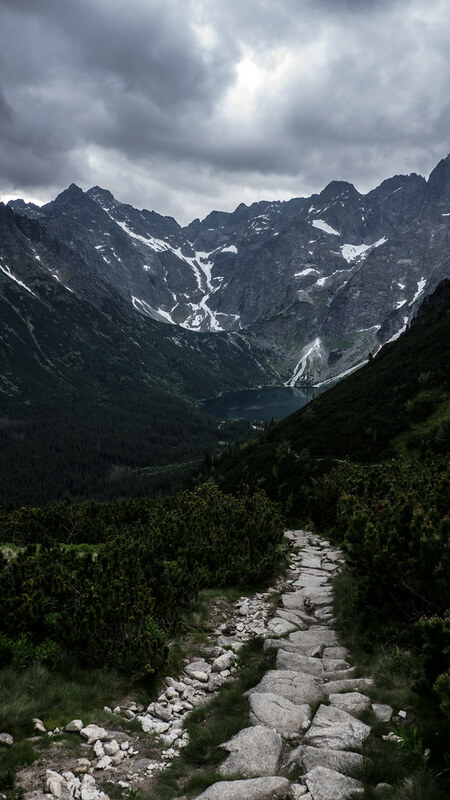 I take a last look back on Morskie Oko and the surrounding mountains, this cradle of Polish Alpinism, and know I will be back when they will be wearing their white dress. So many possibilities. So beautiful. The weather turns fast and as we reach a pass also the rain reaches us. We put on our rain jackets and pants, I have another quick bite from a Müsli bar and then go on. Light showers come down on us, but my view is set on our right. 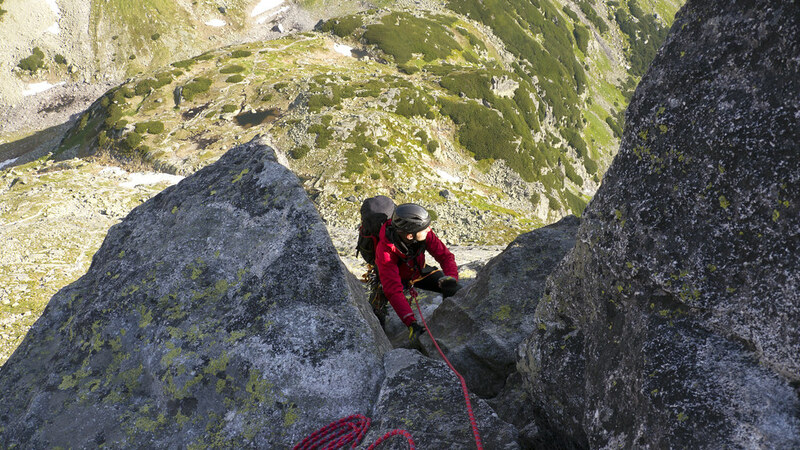 There is Orla Perć, the most difficult “trail” in all of the Tatras, and we plan to hike it the next day. A magnificent ridge walk, all of it above 2.000 m, much of it on steep, exposed terrain. After a shortcut we top out on a small summit which gives a superb view over the Valley of Five Polish Lakes, and down at the shore I already can make out the refuge. We don’t need long till we arrive at it, and are happy to be inside as the rain sets in. The large, wooden common room is full of other hikers, it’s noisy and humid, but people are happy. Good food leaves the kitchen, tasty smells wafting pass me. I can’t resist long. I feast yet again on pancakes, have another cup of coffee, and then set out with Marcin for a quick stroll while the rain has stopped. We go and check out some high water falls, the lakes, walk on narrow trails, and then the rain comes. Lots of rain. We walk back to the refuge, I accelerate, feel the joy of running in my Luna Sandals in the mountains. And it feels like the rain wants to make sure it puts as much water drops down on us before we reach the warm, dry refuge. We arrive dry at the hut, but the weather forecast is not very positive. There’s rain and thunderstorms coming our way, which turn to snow and hail above 1800 m, and I wonder if we’d be able to continue the route I have planned if the weather is like this.